Maybe I'm the only one who walked by the fresh pineapple for years thinking they were too much work but ate fresh pineapple every chance I could get when I found it on a breakfast buffet or when we were out. It's so much better than canned pineapple. It has great texture and it's so sweet. Sure you can buy fresh pineapple already cleaned and cored but it will cost you a lot more money, just like most convenience products. To me, it just wasn't worth it. So I decided I should finally learn to cut a pineapple myself. Surprisingly, it was really easy and only takes about five minutes. Definitely not worth avoiding for all those years. 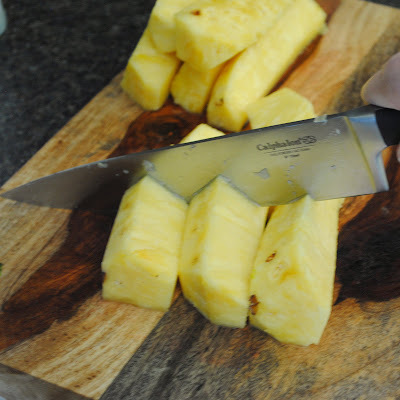 First step, find a sharp knife, a chef's knife or santuko knife would both work great. 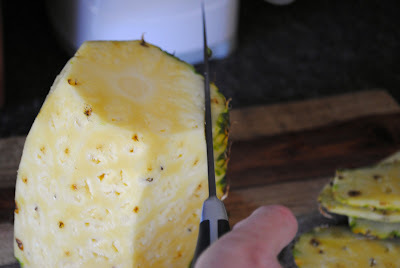 Slice a thin slice off the top and bottom of the pineapple so that it sits flat. 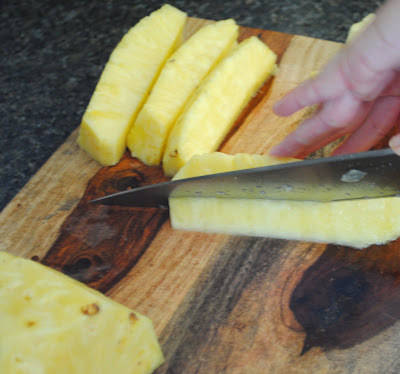 At this point, you have two choices, you can use a pineapple corer to cut out the tough center core and make rings or you can continue with your knife. 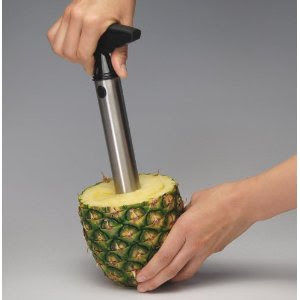 In my opinion the corer isn't worth it unless you are going to be cutting up tons of pineapples. I try to stay away from having too many kitchen gadgets, especially if they only have a single purpose. If you are continuing with a knife, the next thing you want to do is clean off the sides by slicing off the peel and eyes. Try to follow the curve of the fruit so you can get as much usable fruit as possible. Next, cut the pineapple in half and then each half into quarters. Cutting into each quarter at an angle, slice off the core. 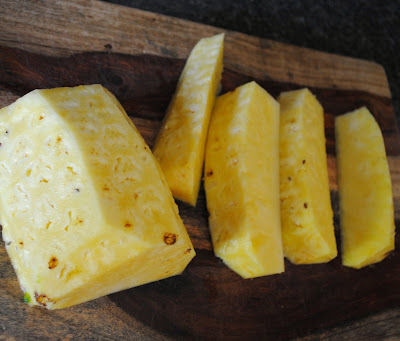 Finally, slice the strips of the pineapple into slices and you're done. It's that simple. 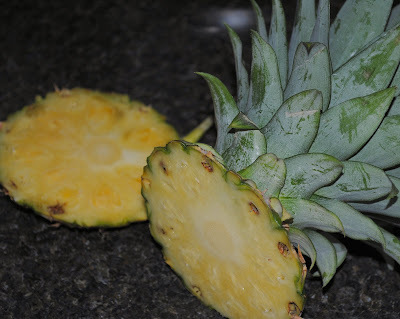 Store fresh pineapple in an airtight container in the refrigerator and use within a few days. I have seen them peel and slice up a fresh pineapple in Hawaii at lightning speed!!! That must come from doing it thousands of times as a part of the demonstrations there! As for me....it is a lot of work....but so worth it! @Rebecca -- Thanks for following - hope you enjoy! @Linda Chapman - I'm sure after you do thousands, the knife skills get pretty good. I wouldn't want to compete with them! I lived in Fiji for a little while - tiny sweet pineapples are sold on sticks in the markets there. They cut the skin off in a spiral, following the eyes (like a curvying v-shaped cut) - so you end up with a gorgeous crenulated fruit that you eat like a giant lolly pop!